With this Eclipse plugin developers get several tools to build Node applications. For example npm install can be triggered and applications can be launched directly from the IDE (including debug mode). Here is a screenshot of the wizard to create new projects based on Express or LoopBack. 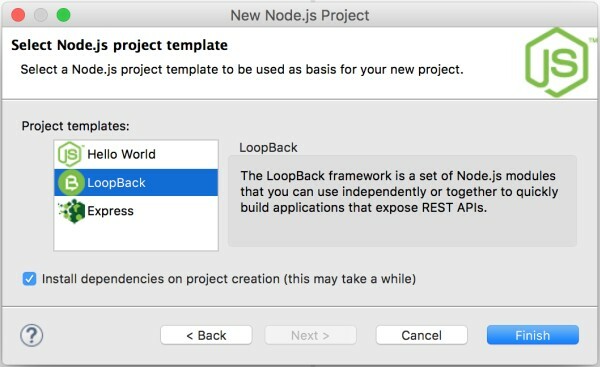 Read the article Introducing IBM Node.js Tools for Eclipse Beta for more information. With this plugin you can deploy and update applications directly on Bluemix from your IDE. Watch the video Create a Node.js application using IBM Eclipse Tools for Bluemix for more information. DevOps services provide a lot of tools for Node developers. Just to name a few: There are GIT repositories, DevOps pipelines and integrated project management. Node developers can even use the web IDE to change code directly on the server. When the Live Edit option is enabled in the web IDE changes take effect immediately. The same functionality even works when doing changes locally via Desktop Sync that comes with the bluemix CLI (Bluemix command line interface). Developers can also debug applications in the cloud via the integrated Node Inspector. Read the documentation to find out more. Developers who are familiar with the Cloud Foundry CLI can use it to deploy and manage applications and services. Alternatively the Bluemix CLI can be used which provides a unified way to interact with Cloud Foundry, Docker, Virtual Machines and more. App Management is a set of development utilities including a web based shell, debugging capabilities and a Health Center agent so that, for example, you can analyze the performance of your app. Additionally for StrongLoop applications metrics, profiling and tracing can be used. Read the documentation to find out more.